After six years in development, the credit-card sized Raspberry Pi computer has gone on sale and sold out almost immediately. The £22 miniature ARM-based PC has been developed with the aim of producing a low-cost PC which will encourage school children to take up coding projects. The small device runs on a 700MHz ARM processor with 256MB of RAM and is surprisingly capable. Its makers promise that it can be used for spreadsheets, word-processing, games and even playing HD video. It boots from an SD card, running the Fedora version of Linux, and uses an HDMI socket to get up to 1080p video on an attached display. There are two models in the lineup – the Model A and Model B. The only difference is that the Model B adds an Ethernet port and has 2 USB ports instead of just one. 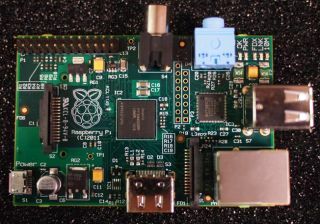 To get the Raspberry Pi running, users will need to add a display, keyboard and mouse, plus power via a microUSB cable as used by many mobile phones. The initial launch is aimed at developers and hobbyists, with the educational launch planned for later this year. The product is being sold through RS and Premier Farnell. Both sites have been struggling under the load and are only appearing intermittently at time of writing. As the initial run has already sold out, pre-orders are being taken for the next batch. For availability updates check out the Raspberry Pi site or follow @Raspberry_Pi on Twitter.